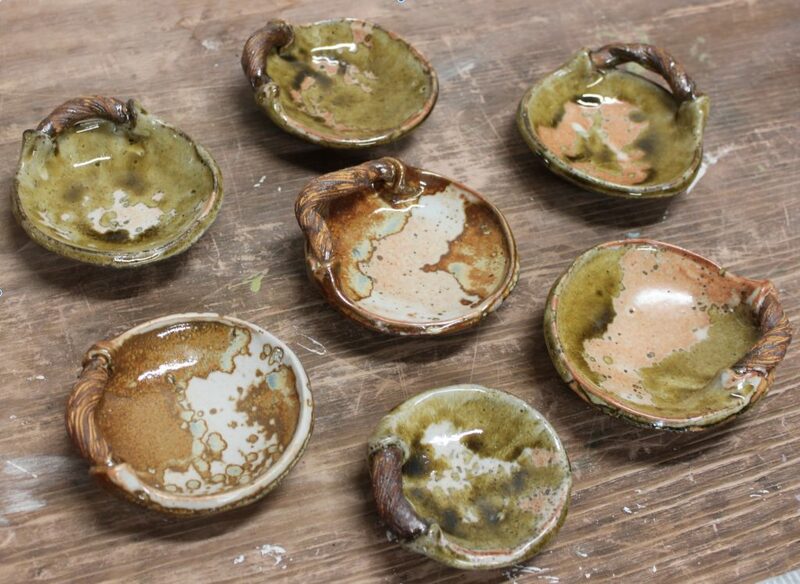 The Village Potters is pleased to feature the multi-talented and multi-faceted ceramic artist, Hannah McGehee, for our 17 Questions series. Hannah also happens to be one of our studio apprentices. We have had the pleasure of working with her since October 2015. We hope you enjoy getting to know Hannah as much as we have! I grew up exploring the American Southwest, finding remains of Anasazi pottery in desert caves and ruins; these shards, nestled in orange dust, exposed me to the value of functionaland sculptural pottery throughout cultures and ages. At the same time, I began to feel that clay is the medium closest to the earth, the medium which feels most tangibly made from earth and rocks. As I continue my own journey with clay, I am constantly amazed by the endless variety of forms, lessons, and ideas which bring me back to nature. Clay offers many of the same benefits and challenges as osteopathic medicine, the slightly-more-conventional life path I originally saw myself taking. Clay is hands-on, requiring you to literally “play in the dirt” for work. It requires patience and learning, adapting to the demands of the material. It promotes collaboration as the exchange of ideas endlessly leads to creative growth. And, the more I teach the more I realize that clay offers amazing healing benefits, just as good medicine should. I grew up adventuring in the mountains of Colorado, the lakes of Minnesota, the canyons of the American Southwest. The Colorado Rockies are my home. Two things about your family. I was very fortunate to grow up in a family where time outdoors—hiking, biking, climbing, skiing—was our priority. I also grew up with two parents who, in their earlier days, enjoyed creative pursuits—music for my dad and photography for my mom. Neither followed these passions professionally, instead making their livelihoods in mental health. I am fortunate to walk a path which allows me to do both— follow my creative passion while helping heal both mind and body. When are you most at peace in your creative process and why? What part of your process brings you the most joy? When I am working on a figure sculpture, the rest of the world disappears. I feel completely focused and completely at peace. What time of day do you most enjoy creating? Early morning when the birds are chirping but the rest of the world still sleeps is my favorite time of day. I love the peacefulness of the studio and the quietness of my mind. Does this path ever scare you? Yes and no. When I graduated from college, I intended to go to osteopathic medical school after a one year ceramics apprenticeship. While that path may be seen as more traditional and secure (and thus to many, less scary), the meandering path I have found will in the end bring me to the same place—a place where I can help people be in touch with nature, their bodies, and their inner sense of peace. I take comfort in the fact that my goals and destination can remain the same no matter the path. Most certainly. I am driven to be good at what I do, but more than that I am driven to help people heal themselves in this crazy, hectic society we live in. That may mean creating a sculpture or piece of pottery which makes them stop and appreciate the moment or it may mean working with them one-on-one, teaching them to become aware of what they can create. Too many people don’t realize their creative potential and I am driven to help them realize it. Indirectly, yes. My inspiration derives from my love of the outdoors and when I am in nature I feel a spiritual connection to this world. Artists are always into something “exciting and new.” What is the “new and exciting” thing is this season for you when you get up to go to work? Trees! And colors! I am engrossed in making my work look as if it is growing into and out of itself. 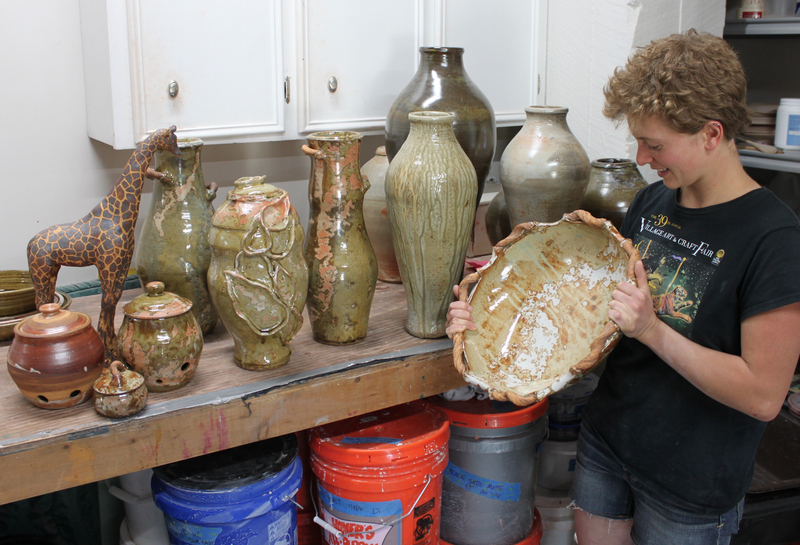 I am also exploring new glazes and glazing techniques which make me look forward to going to the studio each day. I am currently preparing to embark on my first formal study of figure sculpture in Italy and couldn’t be more excited to integrate what I learn into my body of work. What does saying you are an apprentice mean to you? Apprenticeship is a traditional yet underutilized means of learning. Being an apprentice goes beyond lectures into the nitty gritty of every step of the process. As an apprentice, I am am privileged not only to learn technical skills but also to allow my mentors’ work to influence my own. What is the most significant thing you’ve gleaned as an apprentice at TVP? 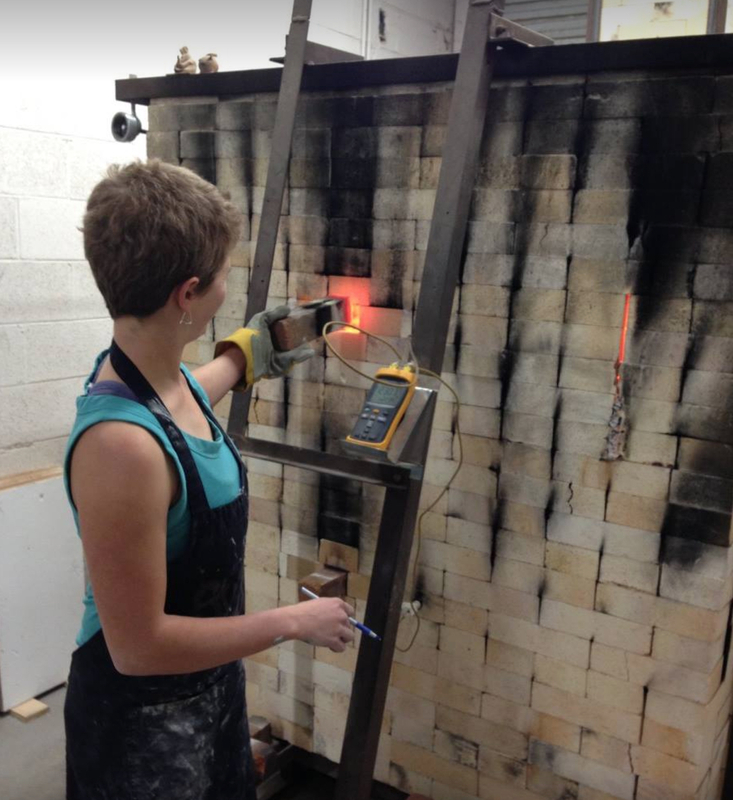 Being an apprentice at The Village Potters has shaped how I think about community clay studios. Previously, I had worked at studios in school settings where other formal structures were in place. At The Village Potters I am coming to truly understand the value in being surrounded by constant inspiration, collaboration, and learning. Who has been a significant mentor in your life? That person that you feel has encouraged you to be this kind of risk taker, a creative, a potter? Since arriving at The Village Potters, each of the members has in some way served as a mentor to me. Sarah Rolland, however, has been the one to guide me throughout this apprenticeship, from life advice to critiques of my work to encouraging my dreams of one day having my own studio and chronic pain retreat center. Her guidance has helped make what once seemed a crazy dream a soon-to-be reality. 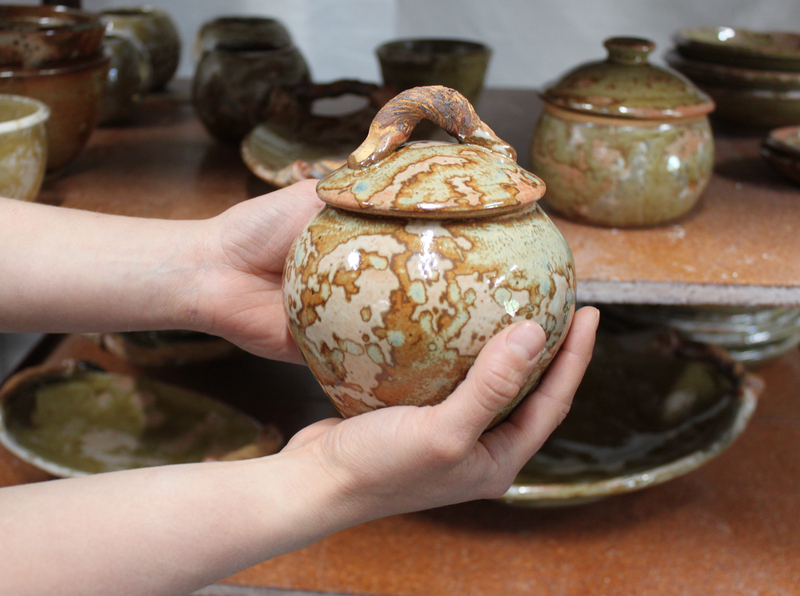 Do you think/ feel pottery has intrinsic value? Every piece of worked clay, from sculpture to functional pottery, was shaped by someone’s hands, someone’s decisions, someone’s dreams. This effort alone gives pottery intrinsic value. Share something about your work that speaks of who you are. Most of my pieces feature some element of raw clay, often rough and un-sanded. This intentional roughness reminds the holder that clay comes from the earth and rocks. As an avid rock climber, I love playing with textures more reminiscent of rock than traditional glazed pottery. What about the business part of your life? How do you marry business and creative process? What do you want to say to those who buy your work? I hope my clay pieces can serve as a reminder to rejoice in the beautiful colors and textures of this world. I hope your hands can trace some of the same paths as mind when you hold them. And most of all, enjoy! If my work can bring some beauty and peace to your home, them my mission is accomplished.